On October 14th of this year, Mr. Avery Ndzoyi, the founder of Espce Opoko, and Roland Nzaou, the founder of eSynergy organization were privileged to meet with an amazing group of women known as the Watervliet Huddle. The Watervliet Huddle meet once a month in the upstate city of Watervliet, located just 10 miles north of Albany to brainstorm on government policies that matter to them and how they can contribute to make a difference in the their community as well as surrounding communities. Mr. Ndzoyi, who is visiting the Albany area for the first time, met with the group so he could share the stories of challenge underprivileged and indigenous children of Sibiti and Bambama, Republic of Congo, struggle with on a daily basis. He explained to the group how students with no financial support work very hard to go to school, but far too often, it’s simply not enough and their dreams of getting an education fade away. He also shared the challenges he faces working to help these seemingly forgotten, indigenous children of Congo. At the end of the meeting, some members were so moved that they formed a quick fundraiser. Susan L. Morrison, Lois Gundrun, and Linda Kabrisky all gave generous donations of $30, $100, and four backpacks, respectively. These contributions are greatly appreciated and will go a long way toward the goal of educating the children of Bambama and Sibiti. These gifts will be instrumental in Espace Opoko’s determination to train students on the use of computers. They will also be used by some of the staff for administrative purposes. Another meeting between Avery Ndzoyi, Roland Nzaou and the women of the Watervliet Huddle took place on October 16, 2017. During the meeting the Watervliet Huddle surprised Averty with a donation of two laptops, a camera record, a head set, two more backpacks, and blank DVD. Averty’d like to say “thank you” to the women of the Watervliet Huddle for being so willing to work with Espace Opoko and eSynergy, in our efforts to pave the way for the underprivileged children of Congo get the education they so deserve. Let us stay confident in our efforts and watch how far this amazing experience will take us. How many students will we be successful in getting a proper education? Ardel Mtsanga is eight years old. She is currently enrolled in the second grade and loves going to school. Ardel’s mother is autochtone (native) or more commonly known as pygmy; her father, however, is non-autochtone; he is not native to the region. Pyg mies in Republic of Congo are treated very poorly. They are discriminated against because of their differences in life style and appearance. When Ardel’s mother was pregnant with her, her father refused to acknowledge he was the father. He threatened Ardel’s mother with violence if she ever told anybody he fathered the child. Fearing violence, she never told a soul. 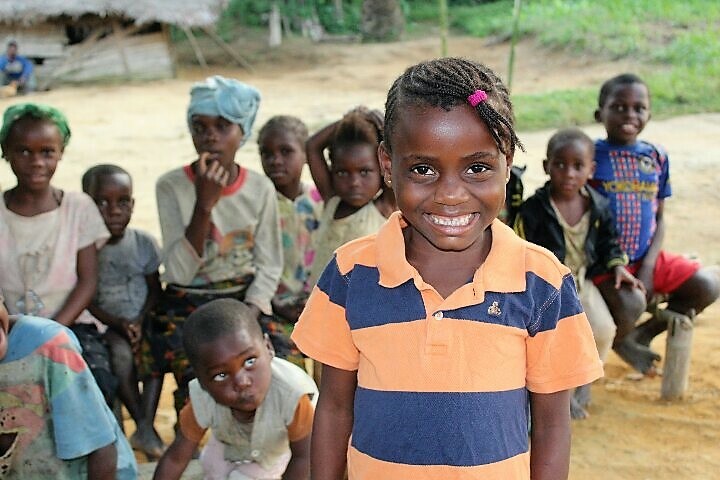 Ardel and her mother now live in a pygmy village buried deep in the Congo jungle. Due to Espace Opoko’s generous support, Adel’s life has completely changed; she went from a life filled with hopelessness and despair to a life filled with hope and happiness. Unfortunately, there are many more pygmy children facing situations similar to Ardel’s. This is the challenge Espace Opoko faces every day and this is why they need our support. If we all work together, we can change precious children’s lives forever. If you are willing to help children just like Ardel, please go to Espace Opoko. The Espace Opoko team proceeded on Friday, October 6, 2017, to the distribution of school kits to the indigenous students of Bambama. All students each received a complete kit consisting of a bag,arithmetic material, notebooks and pens. They will therefore be able to start classes on Monday. We thank all those people who helped us to make this activity possible. They are now ready to go to school. We continue to work to pay the costs of participation in the payment of volunteer teachers, nutrition for 4 high school students. It is difficult, but thanks to the contribution of each one, we will be able to do it. The creation of multiple literacy centers in Lékoumou, a department of the Republic of Congo – These proposed centers will teach reading and writing skills to the indigenous population in the hope they can more easily fit into society and to have the necessary skills to make for a better life. The launch of “Bon Samaritain”, which translated means “Good Samaritan”, across the department of Lékoumou – Bon Samaritain is a program designed to raise the awareness of HIV. This program, currently in existence in others departments of the Republic of Congo, is comprised of several modules for children, adults, and families. All meetings are part of the strategic advancement for the 2017 Espace Opoko program. On New Year’s Day, 2017, Espace Opoko organized an event to honor indigenous parents who are sending their kids to school this year. During that event, Averty Ndzoyi, the founder of Espace Opoko, distributed foods such as oil, rice, canned tomatoes, and other goods to those families as he did last year on New Year’s Day. In stark contrast to last year, when only few indigenous parents sent their kids to school, this year all indigenous parents are sending their children to school. Espace Opoko can now boast that its primary goal to reach out to the majority of the indigenous population was achieved. It must be said, however, that going to school doesn’t ensure all kids will be successful. The next step for this young organization is to keep all the kids in school while at the same time improving their grades. It’s important to note: this year two indigenous children are enrolled in the class with the anticipation of moving on to the high school level. Hopefully, they will meet the necessary grade requirements to be successfully accepted into high school. The e-commerce tee-shirt fashion brand LA KODE has launched an Espace OPOKO tee-shirt on the Amazon website, and 50% of the proceeds go to Espace OPOKO’s projects. For every two tee shirts that are sold, one indigenous child will attend school for an entire month. Please, support this initiative to help these children attend school.